What are the types of Lewy body dementia (LBD)? Who is affected by Lewy body dementia (LBD)? What are the causes and risk factors for Lewy body dementia (LBD)? What are the common symptoms of Lewy body dementia (LBD)? What is the treatment and management of Lewy body dementia (LBD)? Lewy body dementia (LBD) is a disease associated with abnormal deposits (Lewy bodies) of a protein called alpha–synuclein that occurs in the brain and results in problems with thinking, movements, behavior and mood; dementia can also occur. Lewy body dementia occurs when Lewy bodies accumulate and affect chemicals in the brain that lead to problems with thinking, movement, behavior and mood. Dementia is a severe loss of these abilities, especially thinking, and is one of the most common causes of dementia after Alzheimer's disease and vascular disease. 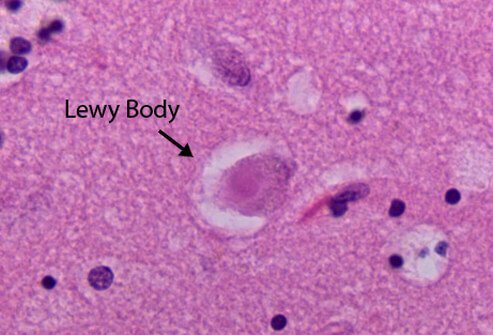 Lewy bodies are deposits of abnormal protein in the brain that interfere with brain cell communication and may occur in several areas of the brain such as the cerebral cortex, limbic cortex, hippocampus, midbrain, brainstem, and the olfactory pathways. Those people that are affected are individuals that have LBD accumulate over time in the brain; early symptoms resemble diseases such as Alzheimer's and may occur alone or with Alzheimer's or Parkinson's disease. The causes of Lewy body dementia are unknown – the reason why some people develop Lewy bodies in the brain is not clear. Risk factors for LBD include age (most individuals are over the age of 50) Parkinson's disease, individuals with REM sleep disorders, and possibly some aspect of genetics although it's not normally considered a genetic disease. There are two related types of Lewy body dementia, the first type is termed dementia with Lewy bodies in the second is termed Parkinson's disease dementia. Not all affected individuals develop symptoms to the same degree. Clinicians and researchers use the "one year rule" to diagnose LBD. If cognitive symptoms appear within a year of movement problems diagnosis is dementia with Lewy bodies, but if cognitive problems develop more than a year after the onset of problems the diagnosis is Parkinson's disease dementia, and this diagnosis is usually done by a neurologist. Surgery: A surgical procedure called deep brain stimulation may be used on some patients with Parkinson's disease dementia. LBD is a disease associated with abnormal deposits of a protein called alpha-synuclein in the brain. These deposits, called Lewy bodies, affect chemicals in the brain whose changes, in turn, can lead to problems with thinking, movement, behavior, and mood. LBD is one of the most common causes of dementia, after Alzheimer's disease and vascular disease. Dementia is a severe loss of thinking abilities that interferes with a person's capacity to perform daily activities such as household tasks, personal care, and handling finances. Dementia has many possible causes, including stroke, tumor, depression, and vitamin deficiency, as well as disorders such as LBD, Parkinson's, and Alzheimer's. Diagnosing LBD can be challenging for a number of reasons. Early LBD symptoms are often confused with similar symptoms found in brain diseases like Alzheimer's. Also, LBD can occur alone or along with Alzheimer's or Parkinson's disease. There are two types of LBD - dementia with Lewy bodies and Parkinson's disease dementia. The earliest signs of these two diseases differ but reflect the same biological changes in the brain. Over time, people with dementia with Lewy bodies or Parkinson's disease dementia may develop similar symptoms. Lewy bodies are made of a protein called alpha-synuclein. In the healthy brain, a protein associated with alpha-synuclein plays a number of important roles in neurons (nerve cells) in the brain, especially at synapses, where brain cells communicate with each other. In LBD, alpha-synuclein forms into clumps inside neurons throughout the brain. This process may cause neurons to work less effectively and, eventually, to die. The activities of brain chemicals important to brain function are also affected. The result is widespread damage to certain parts of the brain and a decline in abilities affected by those brain regions. LBD is a disease associated with abnormal deposits of a protein called alpha-synuclein in the brain. These deposits, called Lewy bodies, affect chemicals in the brain whose changes, in turn, can lead to problems with thinking, movement, behavior, and mood. LBD is one of the most common causes of dementia, after Alzheimer’s disease and vascular disease. Lewy body dementia includes two related conditions - dementia with Lewy bodies and Parkinson’s disease dementia. The difference between them lies largely in the timing of cognitive (thinking) and movement symptoms. In dementia with Lewy bodies, cognitive symptoms are noted within a year of parkinsonism, any condition that involves the types of movement changes seen in Parkinson's disease. In Parkinson's disease dementia, movement symptoms are most pronounced, with cognitive symptoms developing years later. People with dementia with Lewy bodies first have a decline in cognitive skills that may look somewhat like Alzheimer’s disease. But over time they also develop movement and other distinctive symptoms that suggest dementia with Lewy bodies. This type of LBD starts as a movement disorder, with symptoms such as slowed movement, muscle stiffness, tremor, or a shuffling walk. These symptoms lead to a diagnosis of Parkinson's disease. Later on, cognitive symptoms of dementia and changes in mood and behavior may arise. Not all people with Parkinson's develop dementia, and it is difficult to predict who will. Being diagnosed with Parkinson's late in life is a risk factor for Parkinson's disease dementia. The precise cause of LBD is unknown, but scientists are learning more about its biology and genetics. For example, they know that an accumulation of Lewy bodies is associated with a loss of certain neurons in the brain that produce two important neurotransmitters, chemicals that act as messengers between brain cells. One of these messengers, acetylcholine, is important for memory and learning. The other, dopamine, plays an important role in behavior, cognition, movement, motivation, sleep, and mood. Scientists are also learning about risk factors for LBD. Age is considered the greatest risk factor. Most people who develop the disorder are over age 50. Diseases and health conditions: Certain diseases and health conditions, particularly Parkinson's disease and REM sleep behavior disorder, are linked to a higher risk of LBD. Genetics: While having a family member with LBD may increase a person's risk, LBD is not normally considered a genetic disease. A small percentage of families with dementia with Lewy bodies has a genetic association, but in most cases, the cause is unknown. At this time, no genetic test can accurately predict whether someone will develop LBD. Future genetic research may reveal more information about causes and risk. Lifestyle: No specific lifestyle factor has been proven to increase one's risk for LBD. However, some studies suggest that a healthy lifestyle - including regular exercise, mental stimulation, and a healthy diet - might reduce the chance of developing age-associated dementias. People with LBD may not have every LBD symptom, and the severity of symptoms can vary greatly from person to person. Throughout the course of the disease, any sudden, major change in functional ability or behavior should be reported to a doctor. Dementia: Severe loss of thinking abilities that interferes with a person's capacity to perform daily activities. Dementia is a primary symptom in LBD and usually includes trouble with visual and spatial abilities (judging distance and depth or misidentifying objects), multitasking, problem solving, and reasoning. Memory problems may not be evident at first but often arise as LBD progresses. Dementia can also include changes in mood and behavior, poor judgment, loss of initiative, confusion about time and place, and difficulty with language and numbers. Cognitive fluctuations: Unpredictable changes in concentration, attention, alertness, and wakefulness from day to day and sometimes throughout the day. A person with LBD may stare into space for periods of time, seem drowsy and lethargic, and sleep for several hours during the day despite getting enough sleep the night before. His or her flow of ideas may be disorganized, unclear, or illogical at times. The person may seem better one day, then worse the next day. These cognitive fluctuations are common in LBD but are not always easy for a doctor to identify. Hallucinations: Seeing or hearing things that are not present. Visual hallucinations occur in up to 80 percent of people with LBD, often early on. They are typically realistic and detailed, such as images of children or animals. Auditory hallucinations are less common than visual ones but may also occur. Hallucinations that are not disruptive may not require treatment. However, if they are frightening or dangerous (for example, if the person attempts to fight a perceived intruder), then a doctor may prescribe medication. Depression: A persistent feeling of sadness, inability to enjoy activities, and trouble with sleeping, eating, and other normal activities. Apathy: A lack of interest in normal daily activities or events, and less social interaction. Anxiety: Intense apprehension, uncertainty, or fear about a future event or situation. A person may ask the same questions over and over or be angry or fearful when a loved one is not present. Agitation: Restlessness, as seen by pacing, hand wringing, an inability to get settled, constant repeating of words or phrases, or irritability. Delusions: Strongly held false beliefs or opinions not based on evidence. For example, a person may think his or her spouse is having an affair or that relatives long dead are still living. A delusion that may be seen in LBD is Capgras syndrome, in which the person believes a relative or friend has been replaced by an imposter. Paranoia: An extreme, irrational distrust of others, such as suspicion that people are taking or hiding things. REM sleep behavior disorder: A condition in which a person seems to act out dreams. It may include vivid dreaming, talking in one’s sleep, violent movements, or falling out of bed. Sometimes only the bed partner of the person with LBD is aware of these symptoms. REM sleep behavior disorder appears in some people years before other LBD symptoms. Excessive daytime sleepiness: Sleeping 2 or more hours a day. Insomnia: Difficulty falling or staying asleep, or waking up too early. Restless leg syndrome: A condition in which a person, while resting, feels the urge to move his or her legs to stop unpleasant or unusual sensations. Walking or moving usually relieves the discomfort. It's important to know which type of LBD a person has, both to tailor treatment to particular symptoms and to understand how the disease will likely progress. Clinicians and researchers use the "1-year rule" to diagnose which form of LBD a person has. If cognitive symptoms appear within a year of movement problems, the diagnosis is dementia with Lewy bodies. If cognitive problems develop more than a year after the onset of movement problems, the diagnosis is Parkinson's disease dementia. Regardless of the initial symptoms, over time all people with LBD will develop similar symptoms due to the presence of Lewy bodies in the brain. But there are some differences. For example, dementia with Lewy bodies may progress more quickly than Parkinson's disease dementia. Dementia with Lewy bodies is often hard to diagnose because its early symptoms may resemble those of Alzheimer's or Parkinson's disease. As a result, it is often misdiagnosed or missed altogether. As additional symptoms appear, it is often easier to make an accurate diagnosis. The good news is that doctors are increasingly able to diagnose LBD earlier and more accurately as researchers identify which symptoms help distinguish it from similar disorders. While a diagnosis of LBD can be distressing, some people are relieved to know the reason for their troubling symptoms. It is important to allow time to adjust to the news. Talking about a diagnosis can help shift the focus toward developing a treatment plan. Many physicians and other medical professionals are not familiar with LBD, so patients may consult several doctors before receiving a diagnosis. Visiting a family doctor is often the first step for people who are experiencing changes in thinking, movement, or behavior. However, neurologists - doctors who specialize in disorders of the brain and nervous system - generally have the expertise needed to diagnose LBD. Geriatric psychiatrists, neuropsychologists, and geriatricians may also be skilled in diagnosing the condition. If a specialist cannot be found in your community, ask the neurology department of the nearest medical school for a referral. A hospital affiliated with a medical school may also have a dementia or movement disorders clinic that provides expert evaluation. Medical history and examination: A review of previous and current illnesses, medications, and current symptoms and tests of movement and memory give the doctor valuable information. Medical tests: Laboratory studies can help rule out other diseases and hormonal or vitamin deficiencies that can cause dementia. Brain imaging: Computed tomography or magnetic resonance imaging can detect brain shrinkage or structural abnormalities and help rule out other possible causes of dementia or movement symptoms. A single photon emission computed tomography (SPECT) scan can help support a diagnosis of LBD. Neuropsychological tests: These tests are used to assess memory and other cognitive functions and can help identify affected brain regions. There are no brain scans or medical tests that can definitively diagnose LBD. Currently, LBD can be diagnosed with certainty only by a brain autopsy after death. However, researchers are studying ways to diagnose LBD more accurately in the living brain. Certain types of neuroimaging - positron emission tomography and SPECT - have shown promise in detecting differences between dementia with Lewy bodies and Alzheimer's disease. These methods may help diagnose certain features of the disorder, such as dopamine deficiencies. Researchers are also investigating the use of lumbar puncture (spinal tap) to measure proteins in cerebrospinal fluid that might distinguish dementia with Lewy bodies from Alzheimer's disease and other brain disorders. It is important for the patient and a close family member or friend to tell the doctor about any symptoms involving thinking, movement, sleep, behavior, or mood. Also, discuss other health problems and provide a list of all current medications, including prescriptions, over-the-counter drugs, vitamins, and supplements. Certain medications can worsen LBD symptoms. Caregivers may be reluctant to talk about a person's symptoms when that person is present. Ask to speak with the doctor privately if necessary. The more information a doctor has, the more accurate a diagnosis can be. While LBD currently cannot be prevented or cured, some symptoms may respond to treatment for a period of time. A comprehensive treatment plan may involve medications, physical and other types of therapy, and counseling. Changes to make the home safer, equipment to make everyday tasks easier, and social support are also very important. A skilled care team often can provide suggestions to help improve quality of life for both people with LBD and their caregivers. After receiving a diagnosis, a person with LBD will benefit from seeing a neurologist who specializes in dementia and/or movement disorders. A good place to start is an academic medical center in your community. Ask if it has a dementia or movement disorders clinic, which is where you may find LBD specialists. If such a specialist cannot be found, a general neurologist should be part of the care team. Ask a primary care physician for a referral. Physical therapists can help with movement problems through cardiovascular, strengthening, and flexibility exercises, as well as gait training and general physical fitness programs. Speech therapists may help with low voice volume and voice projection, poor speaking ability, and swallowing difficulties. Occupational therapists help identify ways to more easily carry out everyday activities, such as eating and bathing, to promote independence. Music or expressive arts therapists may provide meaningful activities that can reduce anxiety and improve well-being. Mental health counselors can help people with LBD and their families learn how to manage difficult emotions and behaviors and plan for the future. Support groups are another valuable resource for both people with LBD and caregivers. Sharing experiences and tips with others in the same situation can help people identify practical solutions to day-to-day challenges and get emotional and social support. Several drugs and other treatments are available to treat LBD symptoms. It is important to work with a knowledgeable health professional because certain medications can make some symptoms worse. Some symptoms can improve with nondrug treatments. Some medications used to treat Alzheimer's disease are also used to treat the cognitive symptoms of LBD. These drugs, called cholinesterase inhibitors, act on a chemical in the brain that is important for memory and thinking. They may also improve behavioral symptoms. The U.S. Food and Drug Administration (FDA) approves specific drugs for certain uses after rigorous testing and review. However, doctors can prescribe a drug for any use if they think it will help a patient. The FDA has approved one Alzheimer's drug, rivastigmine (Exelon®), to treat cognitive symptoms in Parkinson's disease dementia. This and other Alzheimer's drugs can have side effects such as nausea and diarrhea. LBD-related movement symptoms may be treated with a Parkinson's medication called carbidopa-levodopa (Sinemet®). This drug can help improve functioning by making it easier to walk, get out of bed, and move around. However, it cannot stop or reverse the progress of the disease. Side effects of this medication can include hallucinations and other psychiatric or behavioral problems. Because of this risk, physicians may recommend not treating mild movement symptoms with medication. If prescribed, carbidopa-levodopa usually begins at a low dose and is increased gradually. Other Parkinson's medications are less commonly used in people with LBD due to a higher frequency of side effects. A surgical procedure called deep brain stimulation, which can be very effective in treating the movement symptoms of Parkinson's disease, is not recommended for people with LBD because it can result in greater cognitive impairment. People with LBD may benefit from physical therapy and exercise. Talk with your doctor about what physical activities are best. Sleep problems may increase confusion and behavioral problems in people with LBD and add to a caregiver's burden. To help alleviate sleeplessness in people with LBD, a physician can order a sleep study to identify any underlying sleep disorders such as sleep apnea, restless leg syndrome, and REM sleep behavior disorder. REM sleep behavior disorder, a common LBD symptom, involves acting out one's dreams, leading to lost sleep and even injuries to sleep partners. Clonazepam (Klonopin®), a drug used to control seizures and relieve panic attacks, is often effective for the disorder at very low dosages. However, it can have side effects such as dizziness, unsteadiness, and problems with thinking. Melatonin, a naturally occurring hormone used to treat insomnia, may also offer some benefit when taken alone or with clonazepam. Excessive daytime sleepiness is also common in LBD. If it is severe, a sleep specialist may prescribe a stimulant to help the person stay awake during the day. Some people with LBD may have difficulty falling asleep. If trouble sleeping at night (insomnia) persists, a physician may recommend a prescription medication to promote sleep. It is important to note that treating insomnia and other sleep problems in people with LBD has not been extensively studied, and that treatments may worsen daytime sleepiness and should be used with caution. Certain sleep problems can be addressed without medications. Increasing daytime exercise or activities and avoiding lengthy or frequent naps can promote better sleep. Avoiding alcohol, caffeine, or chocolate late in the day can help, too. Some over-the-counter medications can also affect sleep, so review all medications and supplements with a physician. Behavioral and mood problems in people with LBD can arise from hallucinations or delusions. They may also be a result of pain, illness, stress or anxiety, and the inability to express frustration, fear, or feeling overwhelmed. The person may resist care or lash out verbally or physically. Caregivers must try to be patient and use a variety of strategies to handle such challenging behaviors. Some behavioral problems can be managed by making changes in the person's environment and/or treating medical conditions. Other problems may require medication. The first step is to visit a doctor to see if a medical condition unrelated to LBD is causing the problem. Injuries, fever, urinary tract or pulmonary infections, pressure ulcers (bed sores), and constipation can cause behavioral problems to suddenly grow worse. Increased confusion can also occur. Certain medications used to treat LBD symptoms or other diseases may also cause behavioral problems. For example, some over-the-counter sleep aids, strong pain medications, bladder control medications, and drugs used to treat LBD-related movement symptoms can cause confusion, agitation, hallucinations, and delusions. Similarly, some anti-anxiety medicines can actually increase anxiety in people with LBD. Review your medications with your doctor to determine if any changes are needed. Not all behavior problems are caused by illness or medication. A person's surroundings - including levels of stimulation or stress, lighting, daily routines, and relationships - can lead to behavior issues. Caregivers can alter the home environment to try to minimize anxiety and stress for the person with LBD. In general, people with LBD benefit from having simple tasks, consistent schedules, regular exercise, and adequate sleep. Large crowds or overly stimulating environments can increase confusion and anxiety. Hallucinations and delusions are among the biggest challenges for LBD caregivers. The person with LBD may not understand or accept that the hallucinations are not real and become agitated or anxious. Caregivers can help by responding to the fears expressed instead of arguing or responding factually to comments that may not be true. By tuning in to the person's emotions, caregivers can offer empathy and concern, maintain the person's dignity, and limit further tension. Cholinesterase inhibitors may reduce hallucinations and other psychiatric symptoms of LBD. These medications may have side effects, such as nausea, and are not always effective. However, they can be a good first choice to treat behavioral symptoms. Cholinesterase inhibitors do not affect behavior immediately, so they should be considered part of a long-term strategy. Antidepressants can be used to treat depression and anxiety, which are common in LBD. Two types of antidepressants, called selective serotonin reuptake inhibitors and norepinephrine reuptake inhibitors, are often well tolerated by people with LBD. In some cases, antipsychotic medications are necessary to treat LBD-related behavioral symptoms to improve both the quality of life and safety of the person with LBD and his or her caregiver. But these types of medications must be used with caution because they can cause severe side effects and can worsen movement symptoms. Consult a doctor before using these types of medications. If antipsychotics are prescribed, it is very important to use the newer kind, called atypical antipsychotics. These medications should be used at the lowest dose possible and for the shortest time possible to control symptoms. Many LBD experts prefer quetiapine (Seroquel®) or clozapine (Clozaril®) to control difficult behavioral symptoms. Older drugs called typical (or traditional) antipsychotics, such as haloperidol (Haldol®), generally should not be prescribed for people with LBD. They can cause dangerous side effects. LBD affects the part of the nervous system that regulates automatic actions like blood pressure and digestion. One common symptom is orthostatic hypotension, low blood pressure that can cause dizziness and fainting. Simple measures such as leg elevation, elastic stockings, and, when recommended by a doctor, increasing salt and fluid intake can help. If these measures are not enough, a doctor may prescribe medication. Urinary incontinence (inability to control urinary movements) should be treated cautiously because certain medications may worsen cognition. Consider seeing a urologist. Constipation can usually be treated by exercise and changes in diet, though laxatives and stool softeners may be necessary. People with LBD are often sensitive to prescription and over-the-counter medications for other medical conditions. Talk with your doctor about any side effects seen in a person with LBD. If surgery is planned and the person with LBD is told to stop taking all medications beforehand, ask the doctor to consult the person's neurologist in developing a plan for careful withdrawal. In addition, be sure to talk with the anesthesiologist in advance to discuss medication sensitivities and risks unique to LBD. People with LBD who receive certain anesthetics often become confused or delirious and may have a sudden, significant decline in functional abilities, which may become permanent. Depending on the procedure, possible alternatives to general anesthesia include a spinal or regional block. These methods are less likely to result in confusion after surgery. SOURCE: NIH. Lewy Body Dementia: Information for Patients, Families, and Professionals.